Instructions: Take cardstock size 6" x 12" and score at 6". Card size is 6" x 6". Take pattern paper from Merry and bright Collection and tear the edges as shown. Adhere it on the cardstock. Cut four noel ornament die on white cardstock and paste them on the card with Designer Dries Clear Adhesive. Cut one Eyelet Circle from Eyelet Circle & Basics Small Die and adhere it with foam tape to give some dimension. Next stamp Merry Christmas sentiment stamp from Silent Night Scroll Cling Stamp set with archival ink -plum and cut it with matching die and sprinkle crystal clear glitter and adhere it on the circle die at the centre. 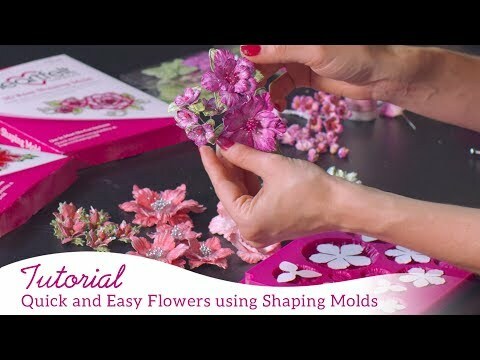 Now stamp some Poinsettia & Holly Clusters and cut them with matching die and shape them with 3D Poinsettia Shaping Mold and create some flowers. Add stamens at the centre of the flowers and sprinkle with some crystal clear glitter. Stamp some leaves from Snowy pine village with archival ink and cut them with matching die and color them with archival ink-fern green and shape them with deluxe flower shaping kit. Stamp some snow laden tree branches adorned with decorative ornaments from Merry Little Christmas Cling Stamp set with archival ink-plum and cut them with matching die and color them. Now assemble all these elements as shown. 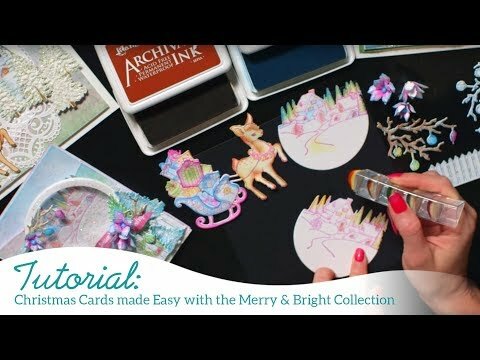 Stamp some jewelry and ornaments from merry and bright accents and cut them with matching die, color them and sprinkle with some crystal clear glitter. Cut one Classic Border Basics Die on white cardstock and sprinkle some crystal clear glitter and paste it on the right side edge of the card. Cut two dimensional die from Festive Holiday Die on white cardstock and paste it on the back of the card on the left side edge as shown and then sprinkle some crystal clear glitter.